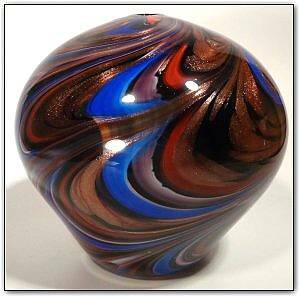 This round bowl/vase features deep and vivid shades of blues, purples, reds, and a tremendous amount of sparking gold topaz over a deep black background. To help the colors stand out and to make them even more deep and intense, a technique was used to add a very thin layer of white in the middle of the inner color and outer color, making the colors just about jump out of the glass. Make sure to zoom in, the richness of the colors is simply amazing!